Getting a PhD in Health and Social Care enables research students to take control of the various processes involved in postgraduate research study. 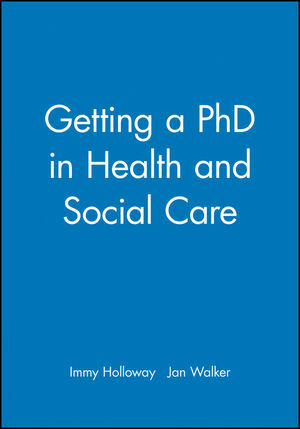 It is an authoritative account of the key issues and challenges faced by postgraduate researchers in health care and social care in their quest for completion of an MPhil or PhD. Part One is designed to assist potential students in negotiating their way through the minefield of decisions and bureaucratic processes involved in enrollment and registration. Attention to detail at this stage of the process will help resolve most of the common problems likely to be encountered. Part Two is concerned with the processes involved in achieving a successful MPhil or PhD following registration. Chapters on writing up, examination procedures, and advice on how to prepare for and cope with the viva are included. "I recommend this book warmly as a reliable guide to all aspects of research for higher degrees, more especially, as a handbook for the practical problems faced in the course of undertaking any type of research. In short, this book is an indispensable aid for researchers and those undertaking health and social care research courses." From the Foreword by Professor J. Akinsanya. Dr Immy Holloway is Reader in the Institute of Health and Community Studies, Bournemouth University. Dr Jan Walker is Principal Lecturer in Multiprofessional Health Care at the University of Plymouth. Immy Holloway is a professor and co-director of the Centre for Qualitative Research in the School of Health and Social Care at Bournemouth University. Though retired from full-time work, she still takes an active role in research and PhD student supervision. As a medical sociologist she has taught health and social care professionals for over thirty years. As well as publishing a large number of articles in peer reviewed journals, she has also written, edited and co-written several books in the field of research, some of which have been translated to foreign languages. Starting out: Introduction; Influences on approaches to research; Decisions about the research; Choice of degree; Starting the process; Research supervision; Going through the process: Writing a proposal; Access and ethics issues; The choice of methodology and research methods; Major issues: From MPhil to PhD; The monitoring process; Writing the dissertation or thesis: The introduction; Review of relevant literature; The methods section; The main body of the research; The examination; Problems; Dissemination of the research.